This incomparable 5,000 square foot home presides on over sixteen acres at thirteen hundred feet of elevation and is bordered by hundreds of acres of state-owned conserved land. 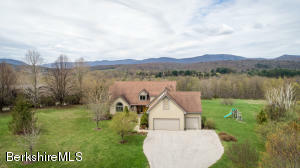 The entry opens into a stunning great room which encompasses the living room, dining room and kitchen, featuring beautiful cherry floors, cathedral ceilings and a large window area to enjoy the spectacular south facing views across the Williamstown valley to Mt. Greylock. Additional highlights include three fireplaces, a library, an exercise room, an enclosed porch, and an octagonal deck that overlooks the heated in-ground pool. Eight bedrooms and seven and one-half baths offer supreme comfort. 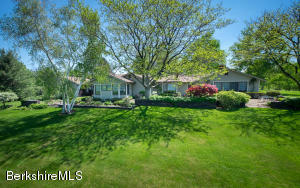 Extensive lawns, landscaping, and hiking trails. Truly a one-of-a kind property. 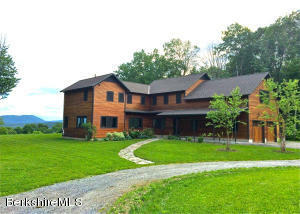 Contemporary home with magnificent views of Taconic Golf Course. 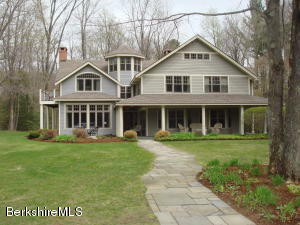 W/5 bedrooms & 4.5 baths, this home has all the charm and elegance of yesteryear, but was built for a modern lifestyle. Featuring a chef's kitchen with open floor plan to breakfast area & family room, formal living & dining rooms, gorgeous Master Suite, 2 add'l ensuite bedrooms, 2 full size third floor bedrooms w/Jack & Jill bath, 4 wood burning fireplaces, 3 gas fireplaces, & a generous mudroom! Enjoy breathtaking panoramic views and glorious sunsets from almost every room of this enchanting property. Situated for the utmost privacy on its ten acre parcel, the impressive one-story contemporary is enhanced by extensive terracing and stone walls with lovely perennial gardens and beautiful mature landscaping. The three bedroom, three bath home includes a luxurious master suite with multiple closets and a steam shower. Taking full advantage of the spectacular views, the step-down living room with marble fireplace and built-in bookshelves and cabinetry provides access to the western terrace, as does the light-filled kitchen and breakfast area. 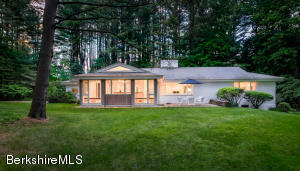 A lovely heated sunroom/breezeway, serving now as an artist's studio, connects to a third garage with potting shed. Pure magic! Enjoy spectacular 360 degree mountain views from this privately sited Contemporary home built in 2014. Less than one mile to the center of Williamstown. 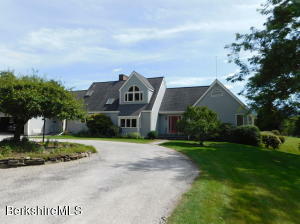 Custom kitchen, 5 bedrooms, 3.5 baths, 2 fireplaces, family room, and large bonus room. Bluestone patio for your outdoor enjoyment. Views from every room! Beautifully appointed with many extras. A must see! 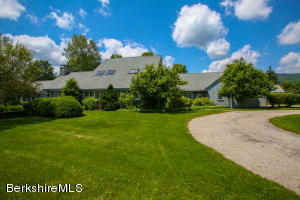 This 20-acre property features a gracious four to five bedroom home with a beautifully landscaped in-ground pool, scenic pasture views and trails for hiking and snowshoeing at your doorstep. Light-filled living room with fireplace and formal dining room. The renovated eat-in kitchen opens to a family room with a fireplace. A bluestone porch and a third-floor cupola room complete the picture. 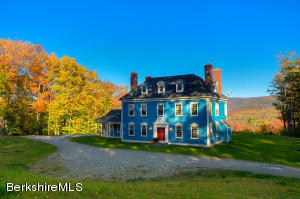 This magical property is beautifully set at the end of a long driveway, overlooking mountains to the east and acres of conservation land to the west, and with an in-ground swimming pool. Surrounded by lush lawns and gardens, the spacious, comfortable, impeccably maintained residence features a generous living room with beams and stone fireplace, cook's kitchen, screened porch, den, first-floor master suite, and three additional bedrooms, and central air conditioning. 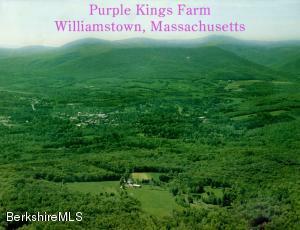 Within easy reach of Williams College, the Clark Art Institute, Williamstown Theatre Festival, MASS MoCA, shops, restaurants, and other cultural, culinary, and recreational amenities. With a premier location, this exquisite one-story home offers the ultimate convenience of in-town living, in one of Williamstown's most sought after neighborhoods.A sophisticated architect designed and European inspired renovation and addition in 2001 provided this residence with the finest of twenty first century amenities and finishes.Handsome Vermont green slate and red oak flooring, American maple cabinetry with granite countertops, two sandstone fireplaces with slate hearths and an open, free flowing floor plan are but a few of the design elements which enhance this residence.Spacious and richly appointed, the kitchen and glass enclosed dining room with cathedral ceiling, integrated buffet and seating benches, are its stunning centerpiece. This immaculate in-town home features open living areas, gleaming cherry floors, a beautiful living room with fireplace and one wall of windows, dining area, and kitchen with a breakfast bar that is surrounded by glass overlooking the yard and gardens. There are three bedrooms and two and one half baths. The second floor is a spacious room that could be used as guest quarters, a second master bedroom, office or work space. 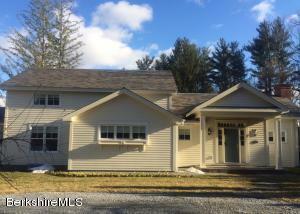 Close to the Clark Art Institute, Williams College campus and Spring Street.